This article will be helpful for people who want to provide discount based on the purchase of products with specific attributes. Discount on mug on purchase "M" size T-shirts. Discount on "S" T-shirt on purchase of "L" sized T-shirts. Discount on "L" T-shirt on purchase on "L" sized T-shirts. Then, when you create the Variable product, choose these attributes and add. Now associate the attribute values and check the "Used for variations" checkbox. IMPORTANT: Please DO NOT select the "custom product attribute". If you use "Custom Product Attributes" that is created on-the-fly, then the attribute specific discount will NOT apply. Because WooCommerce does not create any attributes when you use a custom product attribute. 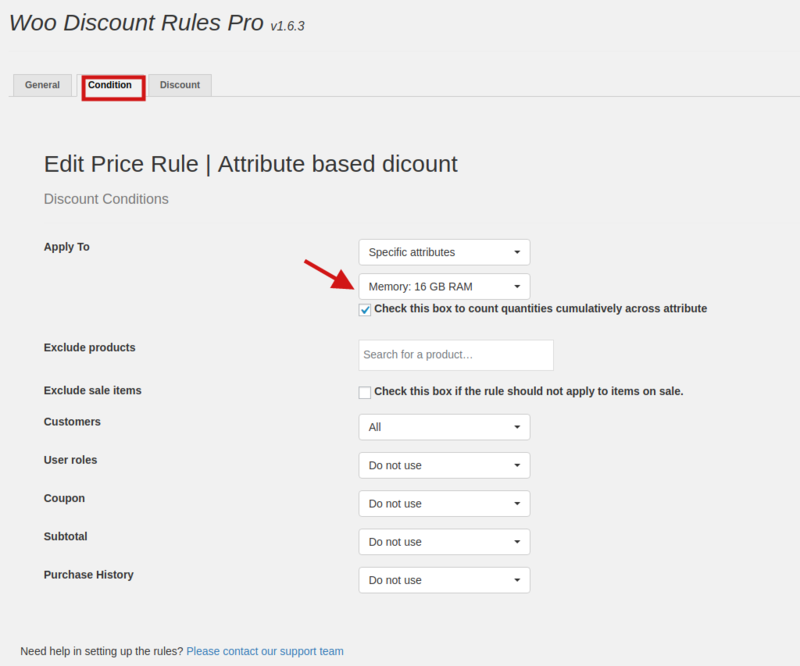 Here, select Price Discount rule and click on "Add new rule". In the general tab, mention a rule name and choose quantity based product/category and BOGO deals as the method. Now, let's specify the attribute in the condition tab. Here I have chosen a 16GB memory card as my specific attribute. So now, lets see the different discounts possible. Buy 1 memory card(16 GB) and get 20% discount on another 16GB memory card. Contact us via the Live Chat button below with your discount requirements. Let us guide you or you can also submit a support request.